Given that a number of teams have been highly consistent in Euroleague action in recent years, it is no surprise when some teams start to develop a rivalry in the Playoff stage. This is the case for these two teams who will be meeting for the third time in seven seasons at this stage of the competition. If the first Playoff game on Tuesday night is about defensive records, this game is likely to be the one that carries more attacking intent. 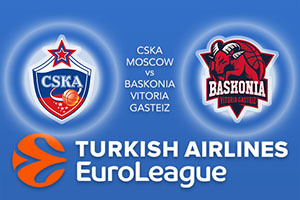 CSKA have a scoring record of 87.3 points per game for the season, the best in the league, while Baskonia have the second-best record, with 83 points per game. We will hopefully see plenty of action at both ends of the court on Tuesday night. In the regular season clashes between these teams, it was the home side that came out on top. In the first clash, the Moscow side had a massive evening, winning by a score of 112-84. That was the evening when Milos Teodosic grabbed a career-high of 34 points and 10 assists. However, there was an element of revenge in the return fixture with Baskonia edging a thrilling game by a score of 79-78. It may have been a much smaller margin of victory for the Spanish side but sometimes those victories are more enjoyable than large romps. Both teams know that the away game will be a challenge but equally, both sides will think that they can cause damage in every single game. CSKA Moscow have the second best scorer in the league, with Nando De Colo sitting with an average of 20.1 points per game and of course, Teodosic is a key player, and he has provided an average of 16.1 points per game and an average of 7.2 assists per match, which sees Teodosic as the assist leader in the Euroleague. Shane Larkin is the key player for Baskonia, offering an average of 13.1 points per game while Rodrigue Beaubois has provided an average of 11.6 points per game and Adam Hanga has chipped in with an average of 10.6 points per game. The bookies clearly remember the last clash of these sides in Russia and you can back CSKA Moscow at -12 at odds of 1.90. For the Over/Under market, in this clash of two highly attacking teams, go OVER 167.5 at odds of 1.90. Bet Now!